Living an authentic life has been a goal for writers and artists forever. Shedding the artifice of modernity to connect with the world around us can both inspire and help create perspective. Probably more hiking and camping trips have been inspired by the works of Thoreau and Whitman than anyone is willing to admit. So it makes sense when the main character in the new film A Walk in the Woods is spontaneously inspired to go take a very long walk. Based on a true story, Robert Redford plays Bill Bryson, a slightly disenchanted travel writer towards the end of his career. He had a string of books about traveling throughout Europe but has settled into a life happily married to his wife (Emma Thompson). While not hostile, he isn’t very interested in the endless parade of technology distracted grandkids and attendance at funerals for vague aquaintances. But he is becoming increasingly aware that time is marching on. On an undefined whim he decides that while he’s still physically able that he wants to hike the over 2,100 miles of the Appalachian trail. This is a hike that many people start every year but approximately than 10% actually finish. So especially for a guy as played by Redford in his 70s (in reality the actual Bryson is 15 years Redford’s junior), this is a risky proposition. His wife at least convinces him to not make the attempt alone, so after exhausting all of his saner friends, he is approached by an old travelling companion he hasn’t seen in decades to tag along. Nick Nolte is Stephen Katz, a grizzled, old, out-of-shape alcoholic with no family. He has fond memories of the old days with Bryson, but Redford’s while Redford’s character is reluctant, he also enjoys the authenticity of his colorful friend. The film is the story of their hike. First and foremost, Robert Redford and Nick Nolte are pleasant company with which to spend the film’s running time. These are appealing actors. Originally when Redford wanted to make this film back in 2005 he meant for it to be a reunion with his old buddy Paul Newman. But film development hell as well as Newman’s retirement from acting and eventual death sidelined that idea. But the themes here still very much fall in line with a lot of what Redford always seems to espouse. This is Horse Whisperer Redford. The guy who enjoys hanging out on his ranch or championing the causes of nature preservation quietly informs this movie. This is a light story with only a surface level touch, but the quiet diginity of this perrenial leading man does a lot of the heavy lifting. 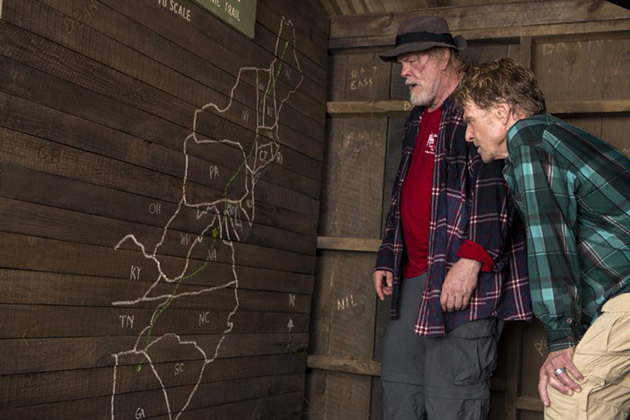 The role of Bryson doesn’t require him to stretch anywhere near as much as his recent turn in All Is Lost which seemed to remind the world that Robert Redford can act. But he is engaging. Meanwhile, this may be the most fun Nolte has been to watch in years. He’s loosely playing off of his real life persona as the alcoholic in the mug shot with the crazy hair that seems to have defined him for the last dozen years. He’s gravelly voiced, loud, struggling with two bad knees, and looks like he’s lived quite a bit. But then there are the big downsides of this film. It is so painfully obvious in both it’s writing and execution that it’s downright irritating. Every story beat you can see coming a mile away. For instance, Kristen Schaal, in one of a few welcome celebrity cameos, plays an obnoxious hiker they are forced to walk with for a while. The joke is cute at the beginning that she talks down to them about every subject. And we get that she talks too much fairly quickly. However, the joke of her character goes on about 3 beats too long. Imagine if the comedy rule of 3s turned into the rule of 5s. Her scenes are just an example of how much this movie telegraphs everything. Early on, as soon as you see Nolte’s character sneaks a whiskey bottle into his pack you know we’re heading for a deeply profound character reveal later in the story. By the film’s logic, even though in real life I’m sure the real author checked in with his family throughout his journey, film Bryson only ever calls his wife once when it is dramatically significant. There is some schtick with falling into water that plays really pedestrian. There is also probably the largest film product placement REI has ever received. The always welcome Nick Offerman trades on his back to nature Ron Swanson persona as an extremely helpful tent salesperson, but nothing overly terrific comes from it other than balking at the price of quality campware. The preview screening I attended was populated by the residents from a nearby nursing home. All of these hamfisted scenes played extremely well with that crowd. And that is definitely an underserved portion of the movie going public. Hollywood can afford to make more movies for and about seniors. But A Walk in the Woods commits the cardinal sin of not being challenging at all. At worst it is predictable and at best it is merely pleasant.